... Islamic Center of Kuwait (ICK) always strives to provide programs for the benefit of English speaking Muslim community in Kuwait in order to remain steadfast in our Deen and to be successful in this world and in the hereafter. We are enclosing a flyer of a joint program by ICK with FIMA and IMWA under the patronage of Ministry of Awqaf & Islamic Affairs & Grand Mosque Administration. The main program will be held on 13 June 2013 in International Islamic Charitable Organization Hall (IICO), South Surra (near Civil ID office) immediately after Maghreb prayers. The map of IICO is given in the flyer. As you know, Mufti Ismail is a powerful and renowned international speaker, Mufti of Zimbabwe and has a large following in the Muslim world, especially among English speaking Muslims. 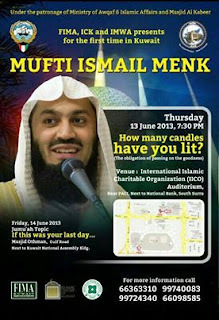 He will also deliver Friday khutbah on 14 June 2013 in Masjid Al-Othman, Kuwait City. We will also have a lecture in Masjid Al-Othman by Mufti Ismail Menk between Maghreb and Eisha on Friday, 14 June 2014. For the English speaking Muslim community.